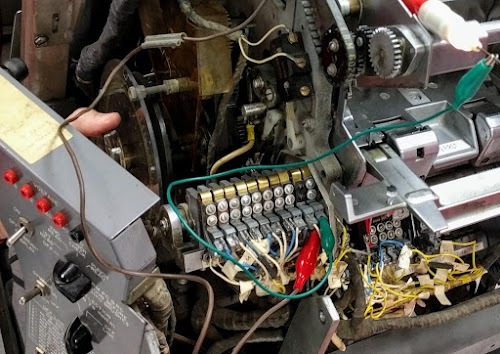 I recently helped repair the card reader for the Computer History Museum's vintage IBM 1401 mainframe. In the process, I learned a lot about the archaic but interesting electromechanical systems used in the card reader. Most of the card reader is mechanical, with belts, gears, and clutches controlling the movement of cards through the mechanism. The reader has a small amount of logic, but instead of transistorized circuits, the logic is implemented with electromechanical relays.1 Timing signals are generated by spinning electromechanical cams that generate pulses at the proper rotation angles. This post explains how these different pieces work together, and how a subtle timing problem caused the card reader to fail. The IBM 1402 card reader/punch. The 1401 computer is in the background (left) and a tape drive is at the right. 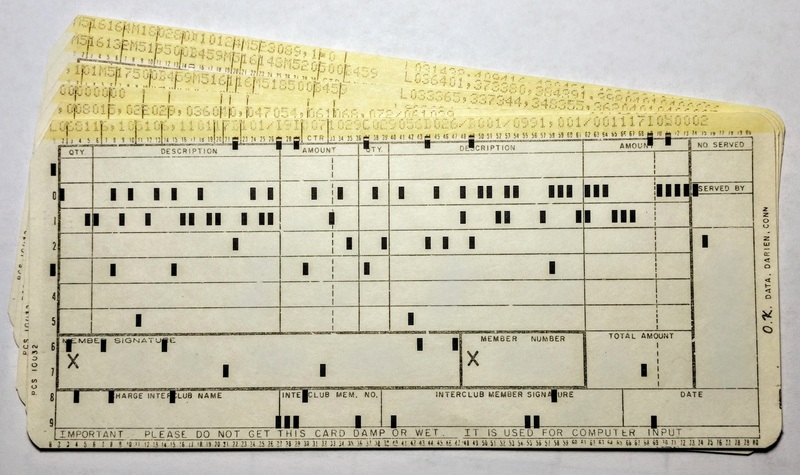 80-column punch cards. Each column of the card holds a character, represented by the holes punched in the column. THE text at the top of the card shows what is in each column. Black paper behind the first card makes the holes more visible. The photo below shows the IBM card reader/punch with the front doors opened up. The right half is the reader and the left half is the punch. (The punch records data on cards; I will ignore it in this article.) The blue panel has the operator controls and indicators. Cards enter through the feeder in the upper right, travel right-to-left through the brushes (behind the blue panel) and fall into the stacker slots (center). To the right of the stacker is the service panel with the dynamic timer (circle with knob); this will be relevant later. The relays, resistors, capacitors and diodes that make up the reader's circuitry are below the service panel. Converting the hole pattern to characters was done by the 1401 computer, not the reader, so this circuitry is fairly basic.3 The garbage can on the lower left collects "chips", the bits punched out of cards by the punch, and triggers a warning light when it is full. With the front doors of the card reader/punch removed, the circuitry is visible. The left half is the punch and the right half is the reader. The *Reader Stop* light is illuminated on the panel, indicating a malfunction. A few months ago a problem with the card reader kept showing up under certain circumstances: the card reader would halt with a "Reader Stop" error, indicating a problem with card feeding and travel.2 Given the age of the card reader at the Computer History Museum, it's not surprising that Reader Stop problems arise. However, in this case, cards were feeding fine and there was nothing visibly wrong. Eventually the 1401 maintenance team determined that the problem occurred if you do multiple cycles of reading a card, printing a line on the printer, reading a card, printing a line, and so on. The first three cards read fine, but the fourth card read always failed with a Reader Stop. But during normal processing, hundreds of cards could be read without a problem. What was different about repeatedly reading and printing? The card reader can read 800 cards per minute, but the line printer can only print 600 lines per minute. Thus, if you continuously read and print, the printer will eventually fall behind. The consequence is that the card reader will occasionally be blocked while the printer finishes a line. In particular, the system can read and print three cards in a row, but there is a delay before reading the fourth card.4 This is normal behavior for the system, but for some reason, this delay was triggering the Reader Stop error. The question at this point of the investigation was why the delayed read triggered a Reader Stop. The logic diagram below shows the many different things can cause a Reader Stop.5 (This logic was implemented in the reader by relay circuits of Byzantine complexity.) Usually a card jam or card feed problem is responsible for a stop, but there weren't any card movement problem. And the card levers (microswitches) that detect card movement were operating correctly. Eventually, the team discovered that removing relay R-10 (Read Clutch Impulse near the bottom of the diagram) stopped the Reader Check from happening. Removing this relay prevented the clutch status from being checked8 so it prevented the error from being reported but didn't fix the underlying problems. It did, however, indicate that the problem was with the clutch. Diagram showing the logic conditions that yield a Reader Stop error in the card reader. From the manual. At this point, I'll explain how the clutch works in the card reader. The card reader is powered by a 1/4 horsepower electric motor. This motor powers a variety of shafts, belts, rollers and cams inside the card reader. However, the reader needs a mechanism to rapidly start and stop card reading under computer control. This is accomplished by a clutch that powers the card feed rollers. With the clutch engaged, cards will be fed through the card reader. With the clutch disengaged, cards will not move (although other parts of the reader will keep running). The GIF below shows the clutch in action: it is disengaged for one cycle and engaged for one cycle. Although the silver pulley (driven by the motor) turns continuously, the black gear is started and stopped by the clutch, which is just behind the black gear. The clutch in the 1402 card reader. The clutch is disengaged for one cycle and engaged for one cycle. The card reader's clutch mechanism. From the 1402 manual. The clutch requires careful timing. If the coil pulls the latch too late, the dog won't engage with the ratchet until the next cycle and no card will be fed. And if the latch is released too late, the clutch won't disengage until the next cycle, feeding an extra card. Either way, this would cause a serious problem if you are, for instance, printing payroll checks. To catch this, the card reader includes a clutch check circuit that ensures that a clutch happens only when requested.8 This circuit is what triggered the Reader Stop issue. Timing in the card reader is controlled by the angular position of the main drive shaft; there isn't a clock signal. A 360° rotation of the drive shaft corresponds to one card read cycle.9 The mechanical and electrical components must be precisely adjusted so they activate at the correct rotational angles. For instance, a card's first row of holes reaches the brushes at 8° and card lever #1 is triggered at 227°. And the clutch is engaged or disengaged at exactly 315°. Electrical signals are generated by rotating cams that open and close microswitches at the appropriate degree angles. For example the read clutch is controlled by cam RC6 that closes at 272° and opens at 342°. 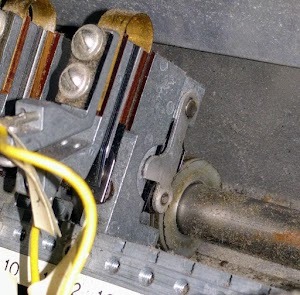 The photo below shows a cam on a drive shaft, with the microswitch above it; when the cam rotates to a high point, the switch closes. One of the cams and microswitches in the card reader. To examine timings, the card reader has an interesting maintenance feature called the Dynamic Timer, which is sort of a mechanical oscilloscope that visually shows the angle timing of signals. The dynamic timer consists of a neon bulb that spins behind a plastic disk labeled with the angles from 0° to 359°. If a signal is selected with a control panel switch, the bulb lights up when the signal is active.1 Because the neon bulb is spun by the main driveshaft, its position is synchronized to the rotation angle of the card reader's mechanisms. Thus, the neon bulb traces out sectors of a circle, indicating when the signal is active. For example, the image below shows the read brush signal, which is activated as each card row passes under the brushes. 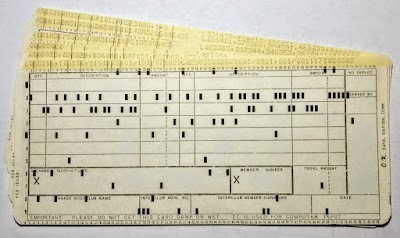 Since there are 12 rows on a punch card, the signal is activated 12 times in a card cycle. By reading the angle labels on the clear plastic dial, the signal timings can be checked for correctness. In addition, the knob in the middle of the dynamic timer can be rotated manually to move the card reader's cycle to any desired angle. The dynamic timer of the 1402 card reader. The 12 signals correspond to the 12 rows on the card, indicating when the row passes through the brushes. We measured the timing of read clutch control cam RC6 and found it was off by about 5 degrees. The manual called the timing of this cam "critical" saying it needed to be within 2° earlier or 0° later from the correct angle.10 Since the cam was well outside the allowed range, we tried to adjust it. The first problem was that the cam was frozen to the shaft; apparently after decades of storage in a a damp garage it had rusted to the shaft. Carl eventually hit the cam hard enough (yet carefully!) with a hammer to loosen it from the shaft so it could be adjusted. The photo below shows how we manually adjusted cam timings. The dynamic timing wheel (left) can be turned by hand until the cam closes, and then the angle can be read from the dial. The adjustment process is rather tedious, requiring trial and error. First, the duration that contact is closed is corrected by moving the contact closer or farther from the cam. After each adjustment, the duration must be manually checked by slowly rotating the dynamic timing wheel 360°. Once the duration is correct, the next step is to rotate the cam a few degrees at a time until it closes and opens at the right angle. Again, the timing must be carefully checked after each adjustment until trial-and-error yields the right cam setting. By manually rotating the dynamic timer wheel, the cam timing (center) can be checked. The light (upper right) shows when the cam has closed. This photo shows cam RL10 being adjusted. Once cam RC6 had the proper timing, we tested the card reader. Surprisingly, it failed just as before. We checked the timing of RC6 with the dynamic timer, and strangely, the timer still showed that it closed 5° too late, even though we had measured it as closing correctly. After puzzling over the schematics, I found that cam RC6 was powered through cam RL10, so a bad timing on cam RL10 would cause the dynamic timer to show the wrong time for RC6. We continued the next week and measurement of RL10 showed it was closing 5° too late. So we repeated the cam adjustment process with RL10. Carl loosened RL10's setscrews, whacked it with a hammer, and was surprised when it spun around on the shaft—apparently it hadn't rusted onto the shaft the way RC6 had. Since the timing of RL10 was now thoroughly off, it took some extra effort to find the right position for it. One complication is that RL cams only rotate while the clutch is tripped, so we had to manually trip the clutch for each test. (This video shows how the clutch can be tripped manually.) After a couple hours of adjustment, the cam had the right duration and then the right start angle. We powered up the card reader and this time it ran all the tests successfully! We had found the elusive problem. Apparently cam RL10 was open a bit too much, so the signal to read a card after a pause in reading wasn't quite able to engage the clutch. Then the clutch check circuitry would detect that the clutch had failed to engage, triggering the Read Stop. Tracking down and fixing the mysterious Reader Stop errors on the card reader was tricky and more time-consuming than most problems. But it provided an interesting look back in time at the obsolete technology used inside the card reader: relay logic, spinning cams and a mechanical clutch. Debugging the card reader is a different experience from tracking down software problems or even normal hardware problems. Just understanding the schematics with their obsolete symbols can be a challenge. Hopefully what we learned in this repair will help us the next time the card reader malfunctions. Many members of the 1401 restoration team were involved in fixing this problem, including Carl, Frank, Alexy, Ron, George, Glenn, Jim and Grant. 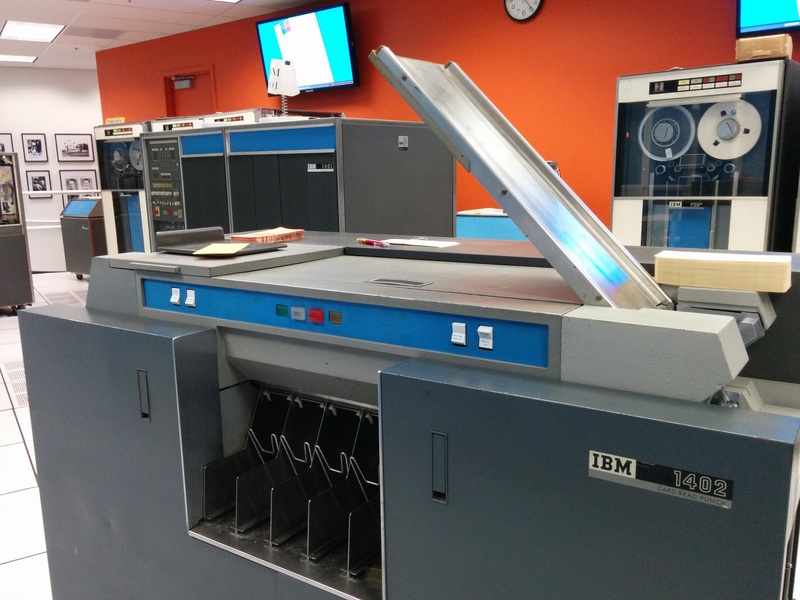 The Computer History Museum in Mountain View runs demonstrations of the IBM 1401 on Wednesdays and Saturdays so check it out if you're in the area; the demo schedule is here. While IBM's computers were supposed to be transistorized by the time of the 1401, two vacuum tubes are hidden deep inside the card reader. These tubes power the neon bulbs for the dynamic timer used for diagnostics. The photo below shows the tubes and the transformer that powers them. 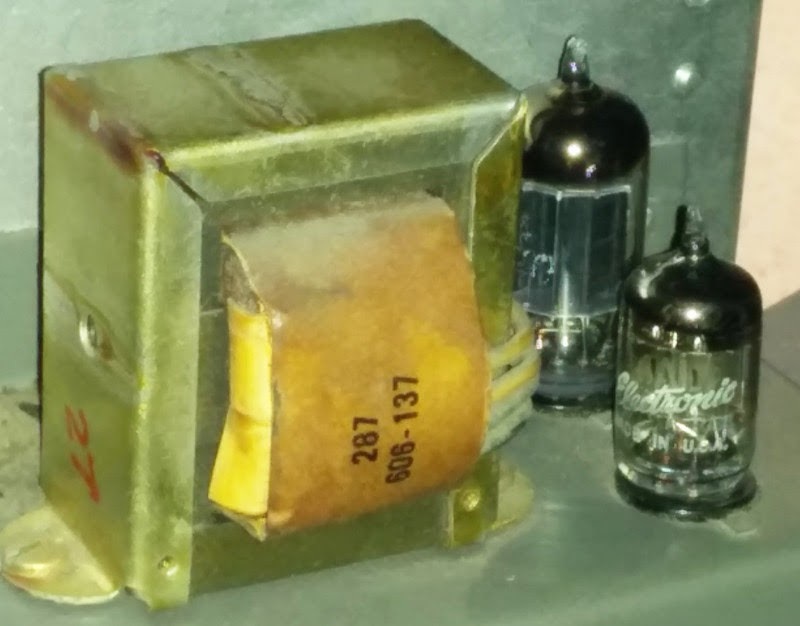 The 1402 card reader contains two vacuum tubes to drive the neon bulbs in the dynamic timer. The operation of the clutch mechanism is a bit tricky. In the diagram below, the ratchet (green) is constantly spinning. 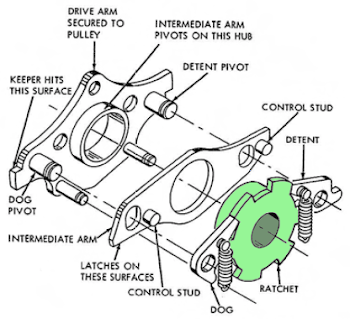 The remaining parts of the clutch are connected together and rotate only when the clutch is engaged. The key idea is that when the intermediate arm (middle) is latched, the control studs push the dogs up and out of the ratchet disengaging the clutch. (This happens because the intermediate arm can pivot slightly relative to the drive arm (left), so the dog pivot and control stud will move relative to each other, swinging the dogs upwards.) When the intermediate arm is unlatched, the dogs are no longer raised and they will engage with one of the ratchet's teeth. At this point, the mechanism is clutched and everything rotates in synchronization, until the intermediate arm hits the latch again, disengaging the dogs from the ratchet. The video of a simpler ratchet clutch may clarify the dog and ratchet mechanism. 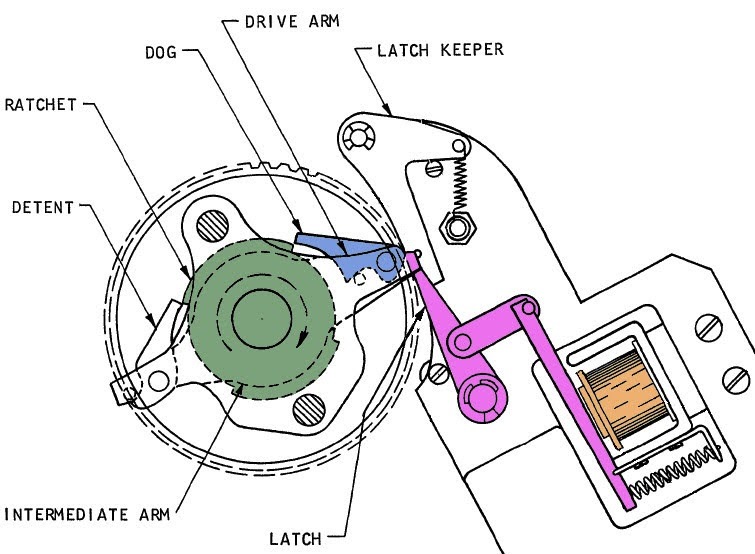 Diagram of the card reader's ratchet clutch, from the service manual. 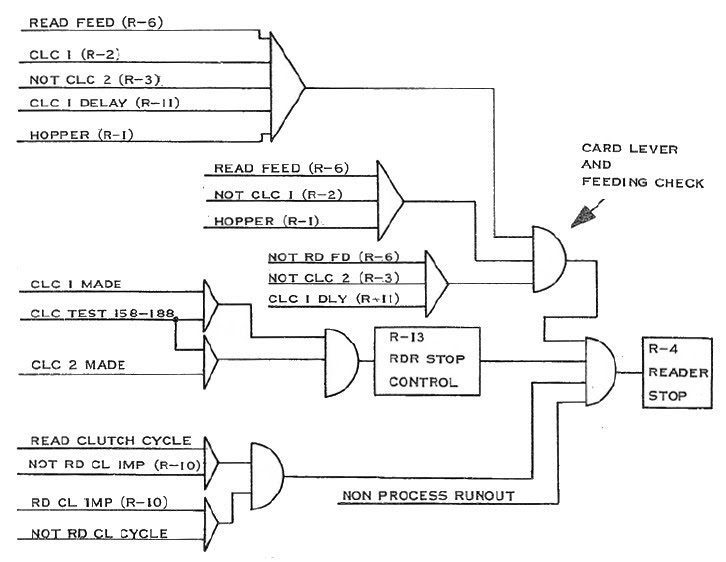 In case anyone (most likely me, in the future) needs to understand the clutch check circuit, I'll give an explanation. The reader sends a "Proc Feed" signal to the computer each time a card could be fed. If the computer wants to read a card, it sends a "Read Clutch" signal back. This signal is gated by cams RL10 and RC6 and cam RC5 and does two things. It triggers the read clutch magnet, the coil that pulls the clutch latch. It also energizes the clutch check relay R10. (See the schematic for details.) 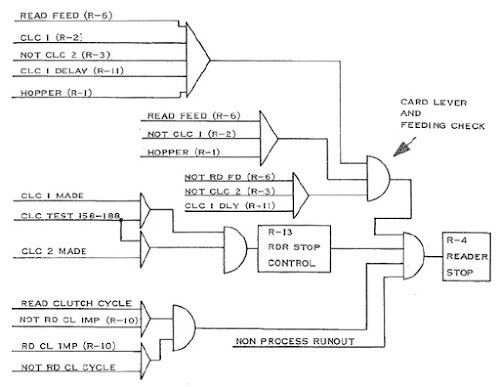 A bit later in the cycle, the clutch status is checked using the circuit below. If the clutch check relay is activated but the clutch did not latch, cam RL10 (not shown) will not be rotating and will remain closed. RL10 will trigger the Read Stop relay R4 through RC7 and R10's normally-open contacts. On the other hand, if the clutch check relay is not activated, but the clutch is latched, cam RL2 will be rotating and will trigger the Read Stop relay through the Read Stop relay R4's normally-closed contacts. The clutch check circuit in the card reader uses cams and relays to trigger a Read Stop if the clutch fails to latch. From the 1402 schematic. Punch card machines are great and all, but I prefer a keyboard and screen for my interface needs. That rate of 13 cards per second is quite impressive compared to the earlier 2 cards per second machines. If the machine could make use of every single punched area to store data, then the reader could read 12480 bits per second (about 1.5 kB) an impressive rate considering storage medium. 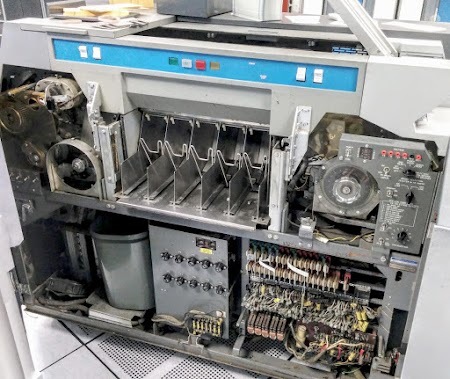 Magnetic tape was much faster though, which led to the 1401 being used as a paper->tape and tape->paper machine to keep slow IO handling off of a central mainframe. "The reader has a small amount of logic, but instead of transistorized circuits, the logic is implemented with electromechanical relays." Logic performed by relays, it is amazing to know how they achieved high speeds using mechanical components. Great explanation and analysis of reverse engineering of a pretty advanced machine for its time. Thanks for the work in getting it to work, and the explanation of understanding how its mechanical and electrical systems get out of whack. Almost all of this knowledge has disappeared with the retirement of IBM CE in the late 1970s and 80s. These machines, despite their idiosyncrasies, lasted for decades, unlike modern appliances. Your approach is also very informative. Thanks so much for your work, please communicate when you will work on this machine next. I would love to see it operating! The "Dynamic timer" was an indispensable diagnostic tool used on a great number of "unit record" card processing equipment (402-403-407 accounting machines, collators, even early computers such as the IBM 650). We couldn't have done without it! Does the CHM 1401 team have spare units (tape drive, card reader, CPU, etc.) to scavenge for parts to keep the display system operational? If not, why not? Are these units really that rare? We do have some spare units (tape drives) otherwise it is just spare parts that have been donated. In some cases we find modern equivalents (drive belts), otherwise we make replacements if we don't have them. Some parts, such as the SMS logic cards, are available in reasonable numbers but most parts are unobtanium. These systems indeed are quite rare. Ken, I have been (very) keenly following your work and that of CuriousMarc. If I lived in the SF area then I'd love to have been involved with your Alto restoration work -- fascinating (and better than any soap opera). That work in itself has got me back onto a retro computing kick with my older 1970's and 80's machine builds. I've had an indirect question at the back of my mind for some time. Your punch card reader blog posting seems to be written as a "technical know-how" for future generations of CHM maintainers. I was wondering what the CHM people have been doing to archive their knowledge and digital asesets for future generations (10, 20, 50, 100 years from now)? I realize that this is a very general question. I'm somewhat concerned about the runtime state of CHM's restored IBM machines once their restoration teams pass away (with you and CuriousMarc being two of the youngest members). The tape drive repair, the faulty power supplies, the cam timing problems, etc. have all been difficult issues to overcome. I guess what I'm asking is how long can these machines be kept running without their current and full restoration teams at hand? I just hope that other younger enthusiasts will come into the mix in coming years and decades to pick up the pace. My father and his historical group have this same issue as most of them are in their 80's with few young people willing to take over their positions or interests. Please keep up the good work. Your postings + YouTube videos are not falling on deaf ears as people like myself yearn to see these very old machines brought back to life. My own work is squarely focused on preserving near-recent history before it is lost to the winds of time (http://www.PastAndFutureHistory.com). And, due to your work and that of CurousMarc, I plan to put a lot of my own retro-computing history on the site once I get done with some of my current non-computing historical projects.